In issue 77 of the free IARU Region 1 VHF newsletter the Chair of VHF-UHF-uW committee Jacques Verleijen ON4AVJ highlights the threats to vital amateur radio spectrum at VHF, UHF and Microwaves. In less than a year we will have our interim meeting about the use of the spectrum above 30 MHz. We have to face some challenges. I want to invite all Member Societies to think about how to promote, defend and use our frequencies. They are wanted by others, both government and commercial, users. So this is a wake-up call to be aware that if we not are using those bands we will lose them. Such a setback will not be the responsibility of IARU(R1), if we lose them, but from the amateur community who often have more commitment to HF, than VHF&up. I know that this statement will shock some of you, but it is true. Our survey on the use of VHF&up made this clear. So I want to invite all Member Societies to think creatively (out of the box, as we say now) to think how to improve activity on our dear bands. Like some have said: “use them or lose them” and “HF is not the only bands for ham radio, but they are the easiest to use”. 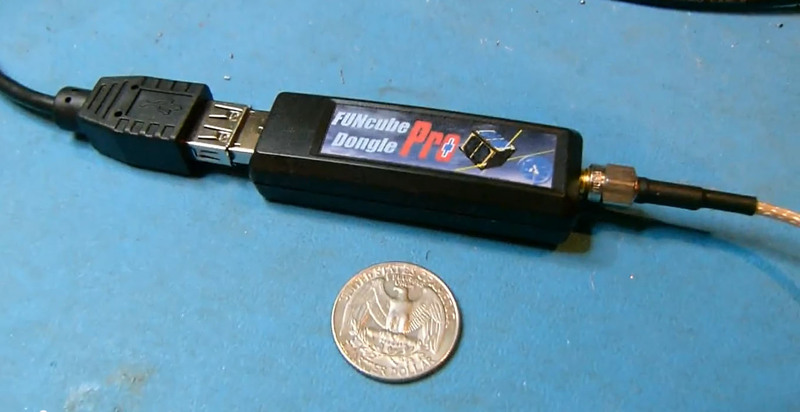 The FUNcube Dongle Pro+ SDR is a complete redesign of the original FUNcube Dongle with many performance improvements and additional features. It covers LF, MF, HF, VHF, UHF and L Band (coverage is 150kHz-240MHz and 420MHz to 1.9GHz), and has an increased frequency span of 192kHz. PY4ZBZ captures stunning image from Noaa 15 using AMSAT-UK FUNcube Dongle. DQ0STRATEX is a special event call on the occasion of the stratospheric balloon project (StratexB) planned for March 2012 by the local DARC clubs Duelmen (N28) and Luedinghausen (N29). They plan to send an amateur radio load, consisting of an APRS and a speech beacon, to the stratosphere with this balloon project. Another payload will be added by the HAMs of the German Aerospace Center (DLR) in Bremen (I04) with an experimental ADS-B receiver. The special event station DQ0STRATEX is active in all modes on all bands between Jan 13,2012, and Jan 31, 2013, handing out the special DOK STRATEXB. They have two balloon missions planned, on Mar 10 around 0930 UTC and on Mar 24 around 1600 UTC, both starting on the airport at Borkenberge near Luedinghausen. The APRS beacon is transmitting on 144.800 MHz and the speech beacon in FM on 430.375 MHz. SWL reports are highly appreciated (also online).